They’re all Catholics who have shaped America. In this page-a-day history, 365 inspiring stories celebrate the historic contributions of American men and women shaped by their Catholic faith. 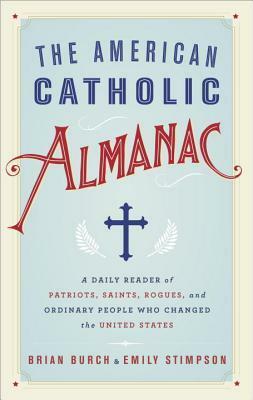 From famous figures to lesser-known saints and sinners, The American Catholic Almanac tells the fascinating, funny, uplifting, and unlikely tales of Catholics’ influence on American history, culture, and politics. Spanning the scope of the Revolutionary War to Notre Dame football, this unique collection of stories highlights the transformative role of the Catholic Church in American public life over the last 400 years. • The first immigrant to arrive in America via Ellis Island was a 15-year-old Irish Catholic girl? • Andrew Jackson credited America’s victory in the Battle of New Orleans to the prayers of the Virgin Mary and the Ursuline Sisters? • Five Franciscans died in sixteenth-century Georgia defending the Church’s teachings on marriage? • Jack Kerouac died wanting to be known as a Catholic and not only as a beat poet? • Catholic missionaries lived in Virginia 36 years before the English settled Jamestown?